Clapham MYC are hosting the first Met and Southern district Footy class Championship and the 2015 Cadenhead trophy on Sunday September 27th at their 360 degree access concrete banked lake on Clapham Common. The prevailing westerly breeze gives a clean wind across the open common and the lake is an ideal size and depth for Footy racing. This is also the first Footy event to be hosted by this club in its 145 year history. 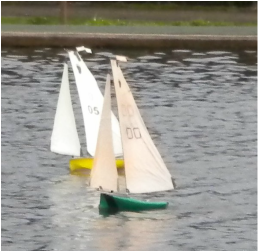 The 2009 Footy Class Rules will apply with respect to boat construction, and in light wind conditions competitors will be asked to measure their largest sail against the 2014 UK Big Rig Template. Ensure that your sail numbers are correctly displayed and that your boat will be capable of passing the box test as defined in the Footy rules. Please ensure that none of the ancillary equipment mounted on the deck protrudes above the top of the box and that the sails are capable of travelling through their full movement without touching the top of the box. Advance notification of your intention to attend would be appreciated and you can register this by filling in the following Entry Form. The Race Officer will be Rob Vice. Registration and measurement checks will start at 10:00am. The briefing will be at about 10:30pm with the first race due to commence shortly afterwards. The final race starting at no later than 3:00pm and any race not completed by 3:30pm will be abandoned. Weed is not normally a problem for the Long Pond, but as the lake is formed by the natural water table, depth sometimes is especially after a sunny summer. Of course the Footy is one of our shallowest classes so this not expected to be problem, but if it is, the organising team will advise all entrants. The entry fee will be £3:00 to be paid on the day at registration. Advanced payment is not necessary, however pre-notification of your intention to attend would be appreciated by the event organisers, and can be done by completing the simple online entry form. This Event is part of the 2015 Open Footy League and is also part of the Novice Competition. We hope to see you on the 27th and wish you a safe journey. Whilst the lake has no postcode, the nearby Windmill pub is at SW4 9DE. The Long pond should be clearly visible to the North east when you reach this location as the lake is not surrounded by excess trees, bushes or shrubs etc. Parking on Rookery road is free on Sundays. Rookery road is one way and must be approached from Clapham Common South Side (A24). If approaching from Balham, pass Clapham South and continue along the A24 in the left hand lane. After the Windmill pub on the left you’ll see the Long Pond and take the left turn onto Rookery Road and park on the left hand side. If coming down from Stockwell, continue down Clapham High Street, and pass Clapham Common Tube before moving over to the right hand lane and turn right into Rookery Road. 35, 37, 137, 155, 255, 345.